When you're cooking from the pantry – and you are able to keep in mind that just about anything you make will, in fact, be edible – you learn how to substitute ingredients. This recipe is a good example of how you can follow a written recipe yet swap in what you have on hand. 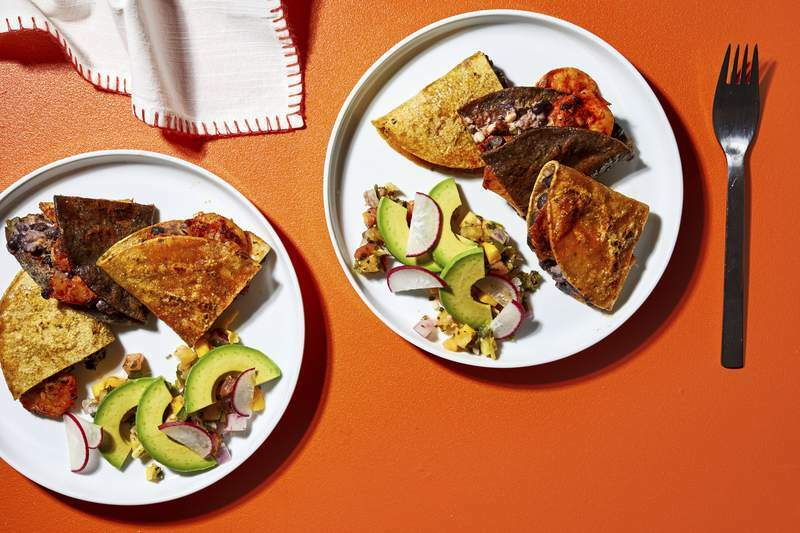 These quesadillas are made with corn tortillas, black beans and jalapeño. But the cheese ... well, it's Parmigiano-Reggiano. Not typical, and it can be dry. Yet its nuttiness works surprisingly well with this set of flavors, and it becomes moist because it is stirred into a sour cream-bean mashup. By cutting the seasoned shrimp in half after they are quickly cooked, you are sure to get their smoky goodness in every bite. We used a mix of yellow and blue corn tortillas here, but you don't have to. Place the shrimp in a microwave-safe bowl. Cover with a paper towel; use the defrost setting in 30-second increments until the shrimp are no longer frozen solid. But they can be cold. Peel them, reserving the shells and tails to make broth for another use, if desired, or discard the shells. In a large nonstick or cast-iron skillet, toss the shrimp with the smoked paprika and 1 teaspoon of the oil, stirring until evenly coated. Cook over medium heat for a minute or two, until firmed up and almost opaque. Transfer to a cutting board; cut each shrimp in half lengthwise. Place the sour cream in a bowl; grate the cheese into it, then stir to incorporate. Drain and rinse the black beans, then add them to the bowl. Finely chop the jalapeño, then add. Stir to incorporate. Wrap the tortillas in a damp paper towel and microwave on high for 10 seconds (to make them flexible). Lay the tortillas on a cutting board or clean countertop; you will need 5 or 6, depending on how thick you spread the filling. Divide the sour cream-bean mixture among them, spreading it over half of each tortilla, then arrange the shrimp halves evenly over the mixture. Fold over and press lightly to “seal” each quesadilla. Heat 1 teaspoon of the oil in the same skillet you used for the shrimp, over medium heat. Once the oil shimmers, work in batches, carefully transferring 2 or 3 of the quesadillas to the skillet. Cook for 2 minutes, until lightly browned on the bottom, then turn them over and cook for 1 to 2 minutes on the second sides. Repeat to cook the rest of the quesadillas, adding the remaining teaspoon of oil, if necessary. Cut each quesadilla in half; serve warm. Serve with your favorite salsa or pico de gallo. – Adapted from a recipe by chef Jamie Oliver.